Pasta with Creamy Turkey Bolognese is heading to your dinner table! This one pot creamy turkey bolognese can go over any style pasta you like! Pasta night is always a good one in our house. We’re always trying to cut down on the carbs so when it’s time to sit down to a big bowl of, well, carbs, we get pretty excited. Like who wouldn’t get excited about pasta dinners like a Chicken Parm Pasta Skillet or even this Pizza Pasta? 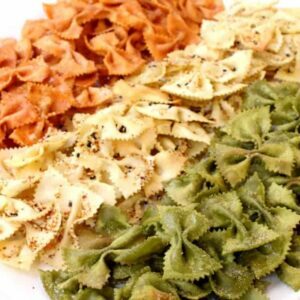 This pasta dish is our next creation for our friends over at Food Fanatic! It’s also a great menu item for entertaining with. 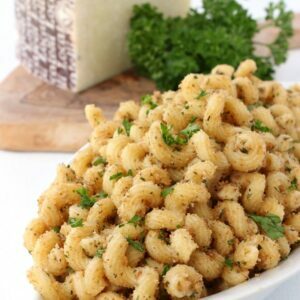 This Garlic Bread Pasta is always a hit, and it serves a crowd and the price is right so you can dress it up with whatever type of sauce you like – cheesy, creamy, or meat based. And this Pasta with Creamy Turkey Bolognese combines all of the above. But you can leave the wine out if you like and substitute chicken broth but I have to tell you, the quarter cup of wine in here really gives this bolognese a killer flavor. And you’re most likely going to be serving some wine with dinner anyway so you’ve already got one open! So like I said, you can serve this creamy turkey bolognese over any style pasta you want to – spaghetti, rigatoni, pappardelle, shells, whatever you have on hand. 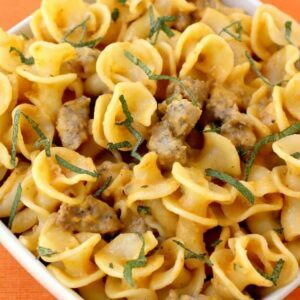 Even a cheese tortellini would be pretty amazing. 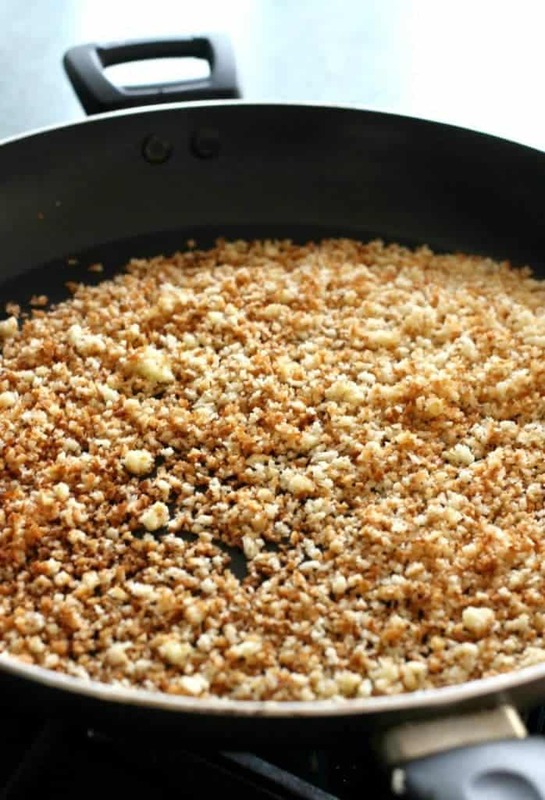 Add butter to a large skillet and toast up some panko bread crumbs, that’s going to be a crunchy topping for your pasta…definitely don’t skip this step! Take the bread crumbs out and start the sauce in the same pan. 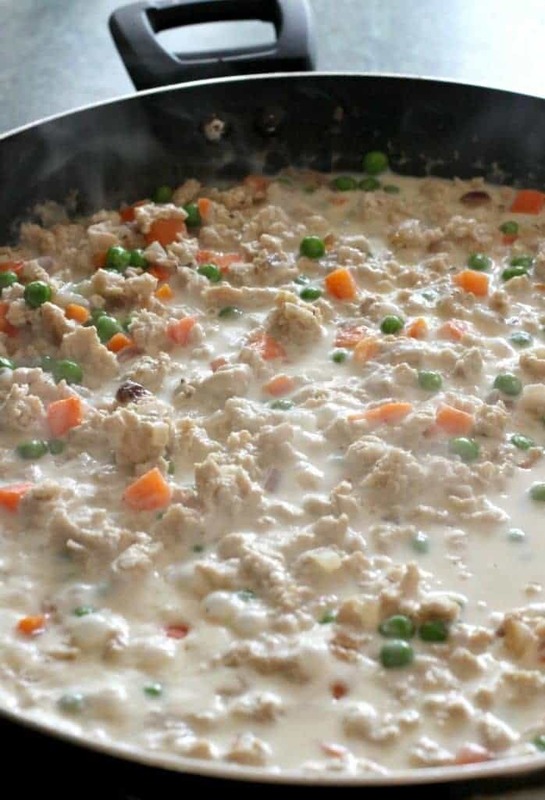 Brown the ground turkey, onions and carrots in a large skillet. 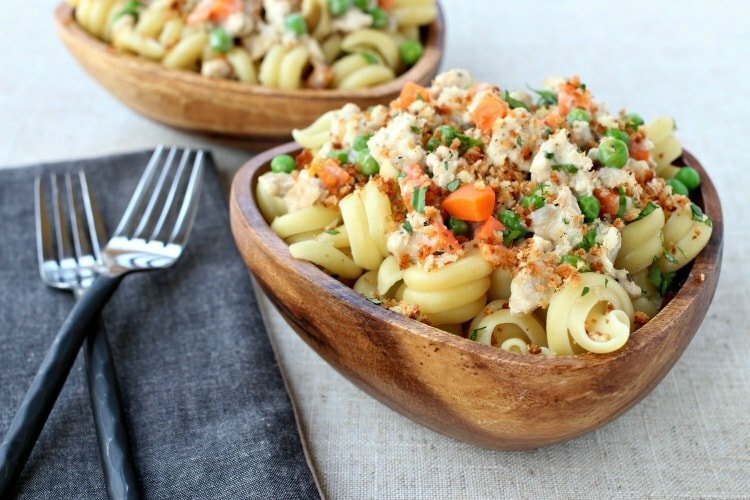 So while we’re talking about the pasta here – you can also swap out the meat too. We always seem to have ground chicken for dinner recipes…so ground chicken or pork would work too, or if you have leftover turkey or chicken, shred it up and stir it into the sauce at the end of the recipe.Stir in the chopped garlic for a minute, then deglaze the pan with white wine. I like to use a dry wine for this like a chardonnay or a pinot grigio over a sweeter wine. Add the flour and stir until all the vegetables and meat are coated, then slowly stir in the chicken broth and bring to a boil. Let this simmer for about 5 minutes until the liquid is reduced, then stir in the heavy cream. Add the frozen peas and carrots and the fresh tarragon, stir and cover while you make the pasta. Drop your pasta in the pot of boiling water and cook according to the package directions – before you drain it though, reserve about a half cup of the cooking water for thinning out the bolognese if you need too. Drain the pasta and return it to the pot. Pour the bolognese over the pasta and stir to combine it well with the pasta, if the bolognese is too thick, now is when you can add a little of the pasta water to thin it out. 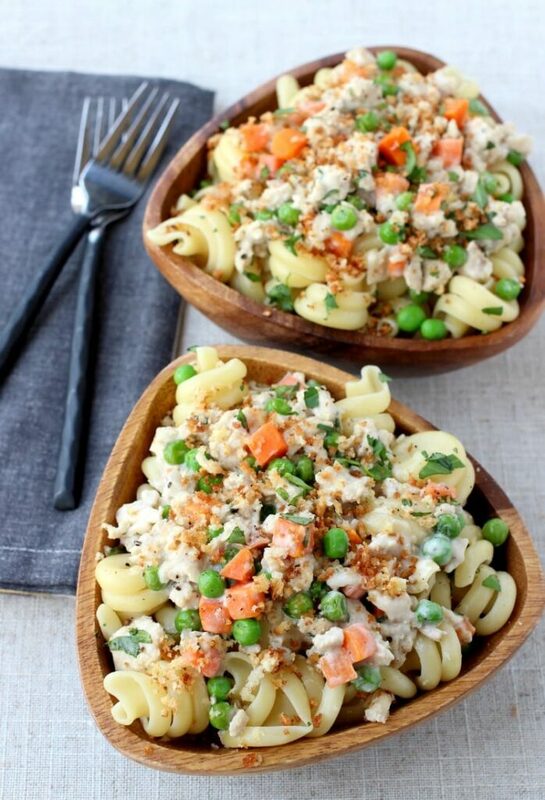 Spoon the pasta into bowls and top with the buttery, panko breadcrumb topping and serve! Next time pasta night comes around in your house, try this Pasta with Creamy Turkey Bolognese to make the whole table happy!